Suau, X.; Ruiz-Hidalgo, J.; Casas, J.
End-effectors are considered to be the main topological extremities of a given 3D body. Even if the nature of such body is not restricted, this paper focuses on the human body case. Detection of human extremities is a key issue in the human motion capture domain, being needed to initialize and update the tracker. Therefore, the effectiveness of human motion capture systems usually depends on the reliability of the obtained end-effectors. The increasing accuracy, low cost and easy installation of depth cameras has opened the door to new strategies to overcome the body pose estimation problem. With the objective of detecting the head, hands and feet of a human body, we propose a new local feature computed from depth data, which gives an idea of its curvature and prominence. Such feature is weighted depending on recent detections, providing also a temporal dimension. Based on this feature, some end-effector candidate blobs are obtained and classified into head, hands and feet according to three probabilistic descriptors. Suau, X.; Ruiz, J.; Casas, J. 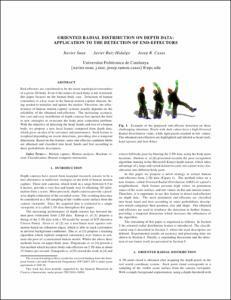 Oriented radial distribution on depth data: application to the detection of end-effectors. A: IEEE International Conference on Acoustics, Speech, and Signal Processing. "Proceedings of the 2012 IEEE International Conference on Acoustics, Speech, and Signal Processing". Kyoto: IEEE, 2012.